Charter rates for dry bulk commodities from grains to iron ore and coal at any point will depend on growth rate in seaborne trade and supply of vessels in different size categories. The world shipping industry continues to suffer as world trade growth since 2012 has remained well below the long-term average growth of 5%. This is happening when the industry is nursing considerable idle capacity in every vessel category. Ahead of the 2008 global financial crisis, since the late 1970s global trade grew strongly, encouraging shipping groups to order new vessels with lengthening delivery periods. The legacy of pre-financial crisis exuberance in ordering ships, which again returned for two years in 2010 and 2011 in tune with strong rebounding of trade, has now left shipping companies high and dry. Shipping had its good time when world trade would grow faster than global gross domestic product (GDP) resulting in an ascending share of trade in world output rise. The International Monetary Fund has projected global growth of 3.5% for 2015 and 3.7% in the following year. International trade, therefore, will continue to register anaemic growth. 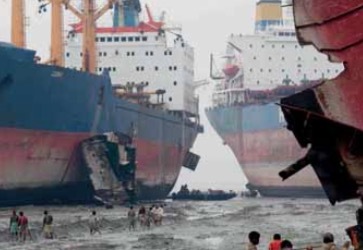 So more and more shipping groups will have to put up with hard times until a semblance of balance between demand and supply of cargo space is achieved by way of accelerated elimination of ageing ships. In any case, it is becoming increasingly difficult for shipping companies to rustle up funds to place orders for new vessels. Funds which took bets on rebound of fortunes in the shipping industry are ruing their decision. Nothing will describe the pathetic state of dry bulk segment of shipping industry more tellingly than three shippers filing for bankruptcy in February. Freight rates staying for long in deficit of ship operating expenses for most vessel owners first claimed a victim of privately owned Danish group Copenship and then China’s Winland Ocean Shipping filed for bankruptcy protection in the US under chapter 11. Filing with a US federal bankruptcy court under the chapter for protection allows a debtor to reorganize business. South Korea’s Daebo International Shipping has too filed for debt rehabilitation. Banks are not sure if they will be able to recover money lent to shipping groups now in the doldrums. Funds which took positions in the shipping counter in expectation of a turnaround have burnt their fingers badly. The Baltic Dry Index, an aggregate of indices for Capesize, Panamax and Supramax size vessels for tracking dry bulk shipping and trading costs, is staying at an all-time low despite some recent improvements in freight rates. Whatever rates improvement is happening is, however, solely due to rises in bunker prices. Supply of dry bulk tonnage remains much in excess of demand as world trade growth has remained well below the two decadal average of 5.3%. Even after providing for routine New Year-related distortions in foreign trade data for January and February when the Chinese economy virtually takes a two-week break, nearly 20% fall in imports in January by the world’s second-largest economy did not bode well for the shipping industry. The super size Capesize and Panamax vessels took a hit last year as the amount of coal burnt in China fell for the first time this century leading to lowering of coal imports. The 2014 fall in coal use caused by increasingly greater reliance on electricity generated by hydel and other renewable sources contrasts with 5% to 10% annual fossil fuel use growth rate for most of this century. Less burning of coal by China is no doubt good for environment. But that leaves dry bulk shipping capacity idle. A rise in Indian coal imports could only partly compensate for shrinkage in Chinese imports. No wonder so many more Capesizes and Panamaxes are employed to ship iron ore from Brazil and Australia to China — taking advantage of a nearly 50% collapse in ore prices and low freight lifted imports of steel- making ingredient by 112.2 million tonnes (mt) to 932.5mt. China’s January steel production fall of 4.7% to 65.5mt on a year- on-year basis remains a concern for ore exporters. But January is seen as a ‘silly month’ for Chinese business setting no trend for the rest of the year. Hasn’t China Iron and Steel Association said the country’s ore imports will climb to a record 1 billion tonnes (bt) this year with Australia and Brazil claiming a share of 80%? Ore inventories in Chinese ports have been used up to a point which should give a push to imports. This will bring some relief to shipping lines. “Capacity overhang in dry bulk segment is so deep that freight rates will continue to remain under pressure for at least next couple of years,” according to Peter Cremers, CEO of ship management major Anglo-Eastern Group. Weather-beaten shipowners have finally made a spirited beginning in cutting overcapacity. They are consigning vessels to scrapyards at one of the busiest paces in recent decades. Demolition activity is most pronounced in dry bulk segment of the industry. In January, the number of Capesizes sold for scrapping nearly totalled the number decommissioned in the whole of 2014. Even then it will not be too soon before demand catches up with shipping tonnage. A year ahead of 2008 global financial crisis, investment in shipbuilding was a staggering $226 billion. Since the crisis triggered by Lehman Brothers filing for bankruptcy happened in September, orders for new ships claimed another large investment of $178 billion in 2008. Then battered by collapse in commodities market and freight rates, investment in new ships in 2009 fell drastically to $44 billion. However, Clarksons Research informs that since then that investment in the range of $91 billion and $131 billion has been made annually. But banks are not any longer comfortable in financing new ship construction. This explains why some contracted dry projects are being swapped to wet projects, meaning postponement in new ship deliveries. Abundance of capacity has translated into world cargo fleet productivity declining from a peak of 9.1 tonnes of cargo per deadweight tonnage (DWT) in 2004 to 6.5 tonnes per DWT in 2014. Productivity fall is due to global seaborne trade growing by 44% during this period in the face of 102% fleet capacity expansion.